B-Safe Safety Door Cushion - Set of 2 | Multicolour | Protect your little one from danger in the household. 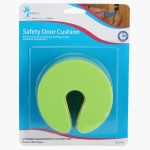 Prepare your house with extra safety by getting this set of safety door cushion. It comes in a funky tone that is attractive adding to the decor of your house. The cushioned lock prevents your child from accidently getting hurt.